Los Angeles-based artist Sarah Cain takes painting outside of its traditional canon by using man-made and natural materials to create a tension between abstract, geometric logic, and a rush of fluid, free-form lines. 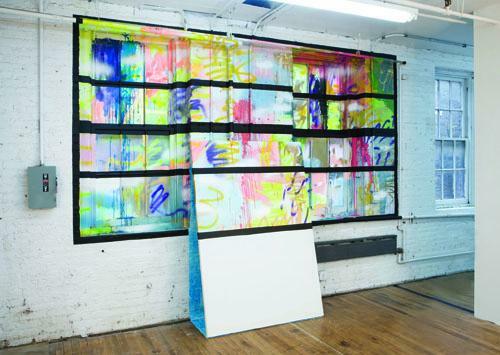 Her canvases become sculptural as they extend beyond their frames to literally push the limits of what a painting can be. Sarah Cain was born in Albany, NY in 1979. She received her B.F.A. from the San Francisco Art Institute, San Francisco, CA in 2001 and her M.F.A. from University of California Berkeley, Berkeley, CA in 2005. Cain is represented by Anthony Meier Fine Arts, San Francisco, CA. Her work has been exhibited at the San Francisco Museum of Modern Art, San Francisco, CA; Orange County Museum of Art in Newport Beach, CA; KN Gallery, Chicago, IL; and the Seiler + Mosseri-Marlio Gallery, Zurich, Switzerland. Casa Magazine, Santa Barbara, CA; Brush & Associates, Santa Barbara, CA; Santa Barbara Independent; Santa Barbara News-Press; Susan E. Bower Exhibition Fund; and Wayne McCall & Associates, Santa Barbara, CA.